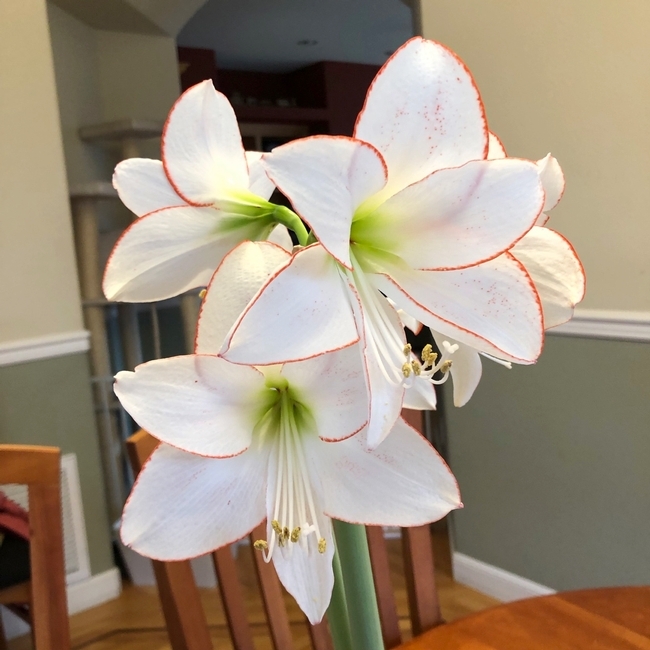 I love growing amaryllis bulbs (Hippeastrum genus) for a splash of indoor color to brighten a grey winter day or to give as a holiday gift. The plants are easy to grow, grow astonishingly fast each day once they are established, require no special treatment to flower the first time, and have spectacular blooms. The hardest part of growing amaryllis may be choosing a color! While many people throw away the bulbs once they are done blooming, amaryllis may bloom again the following year with proper care. 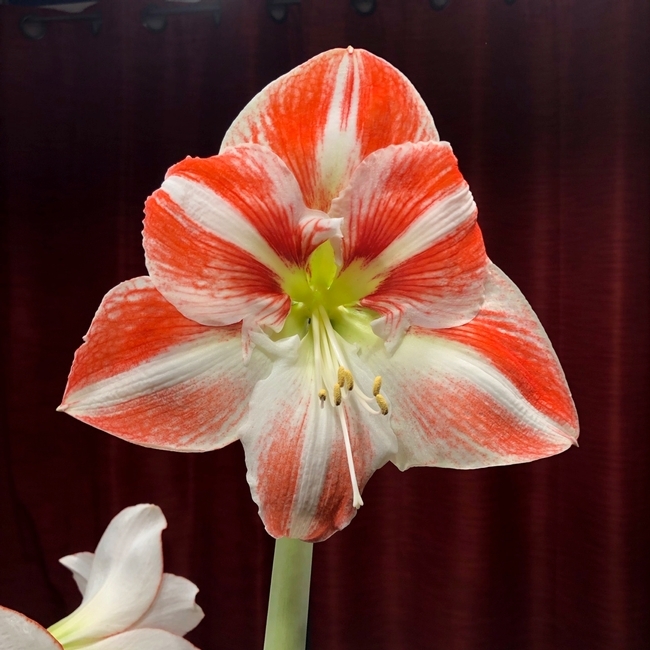 In sum, once the amaryllis is done flowering, it continues to require the basics – sunlight, water, and fertilizer – and then a period of dormancy. Remove each flower as it fades. Once the amaryllis finishes blooming completely, cut the flower stalk. Move the plant to a brightly lit location and continue to water and fertilize the plant regularly through the spring and summer. 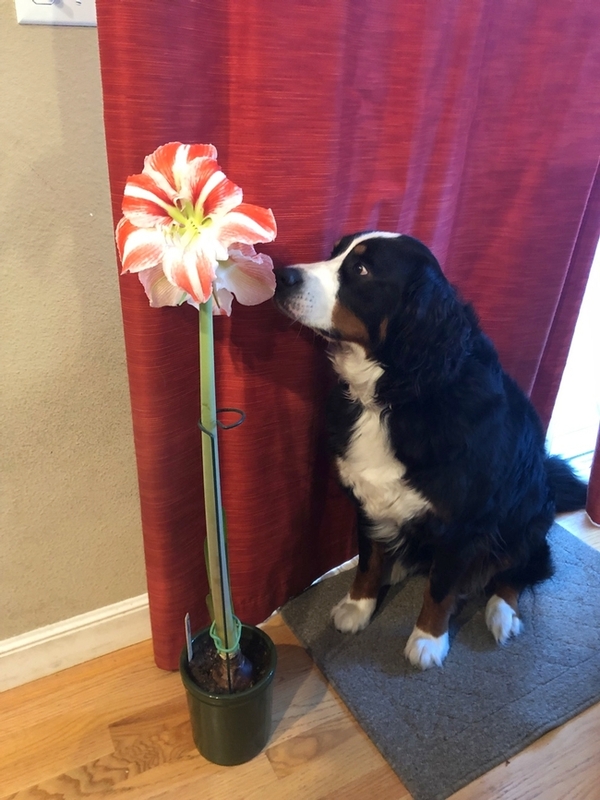 You may keep the amaryllis as an indoor plant during this growing time or place it outside after the danger of frost has passed in the spring. Begin preparing your amaryllis for dormancy about eight to ten weeks before you'd like it to start growing again. Move it to a cool location. Ideally, the plant should be stored in temperatures around 40 to 55 degrees Fahrenheit, but since those temperatures can be difficult to achieve in Solano County in the fall, just do your best. Although the conditions may not be ideal, I've had success reblooming amaryllis by leaving it in a shady side yard. Gradually reduce watering over two weeks to dry out the soil. Remove the foliage once it has died. Do not feed or water the plant during this resting period. If you have left the bulb outside, make sure that it is located in a dry area so that it doesn't receive winter rains. Check the amaryllis weekly during its dormancy period. The tip of a new flower stalk should appear in the center of the bulb after eight to ten weeks. Repot the plant with fresh soil, move it back to a sunny location, and begin watering it to start the blooming process over again. In time, small bulblets may develop beside the primary amaryllis bulb. The bulblets may be separated from the large bulb and repotted to bloom in a few years, or they may be left attached and allowed to grow to full size along with the original bulb. With this simple care, the amaryllis will bloom and brighten your home for years to come! Ah, one of my favorite bulbs. Great article, Erin.